Quequen is home to dreadlocks, para-gliders, and Quilmes-drinking beachcombers. For surf and sun, Quequen is your Argentine summer destination. 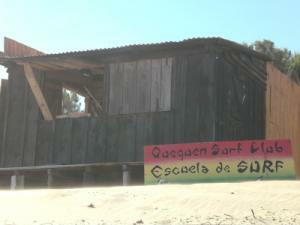 Located along the Atlantic coast, Quequen is a sleepy beach town with a golden bullet – surf school. Wide beaches and consistent wind combine to create an ideal place to study surfing. Leave your pocket protector and glasses at home, Marvin, this class requires no textbook and assigns no homework. You hardly even have to know how to swim since shallow waters extend out to the deep-breaking waves. Quequen is what Argentines refer to as tranquilo. Its sand roads are designated by numbers and family homes have names like Las Brisas de La Luna and La Caracol – giving it a country feel. Fresh fish can be bought at the house near the corner store and the only restaurants are on the beach with separate outdoor bars that blast homegrown reggae and hip hop hits alike. 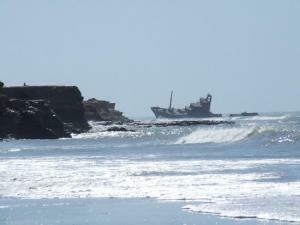 The beach itself is a beauty; wide and clean with a view of an anchored ship along the distant shore, it stretches away from the pier that separates it from the port off to uninhabited beaches for miles. A ten minute walk from the main beach along the dune cliff brings you to “Jamming,” which serves as both a hostel and Quequen’s only nightlife destination. “Jamming” has a raga vibe that, along with the surf school, sets the tone for an Argentine surf scene, of sorts, in Quequen. Kids with dreadlocks and long boards play music and show off their great tans by day, then sip Fernet and Coke and mingle by night. This past New Years Eve at Jamming was far better than to be expected in a town where the corner market’s row of computers are the regular place to be. With decent deejays and a great looking, self-confident crowd spilling out onto the cliff overlooking the beach, Jamming was the perfect place to ring in the new year. 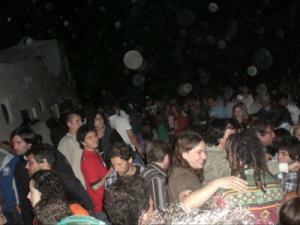 The party went until ten in the morning and was reminiscent of non-Pacha Ibiza. 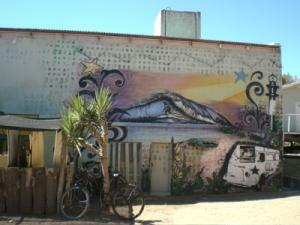 Somehow, a hostel and a surf shop manage to create an oasis of Ibiza/California on the Argentine Atlantic coast. Good vibes. Thanks for your comments about Jamming Hostel New Year Eve party. I’am the DJ of that night, thanks again. And come back any time to Quequen. Saludos. (Sorry for my “pobre” english). visit us when ever you want. You’re all welcome! We’ll be sure to put quequen in on our travel list and pay a visit to you guys. Hi, my name is Ayelén i live in buenos aires, but every year we like to go Quequén. Is my fauvorite place in Argentina. I really love it. This page rendered in 0.23 seconds.